I'll just begin by saying that I have had way too many bad haircuts in my lifetime. The issue with getting a haircut is that often you have something in mind, while the stylist has something else in mind. There have been times when I've asked for my hair to be cut in a certain way, but it ends up nothing like how I asked for it, because the stylist decides that it looks better another way. However, I don't agree. People recommend that you try out different salons until you find one that you like, and then always go back there, but there's still the issue of finding that one place that is just to your liking. Getting a haircut at a place you've never been to before is usually a hit or a miss. You just may find the perfect place and get the perfect cut, but it could just as equally be a disaster. Even if the price is high, it doesn't necessarily mean that you'll get a nicer haircut, it all depends on the stylist. 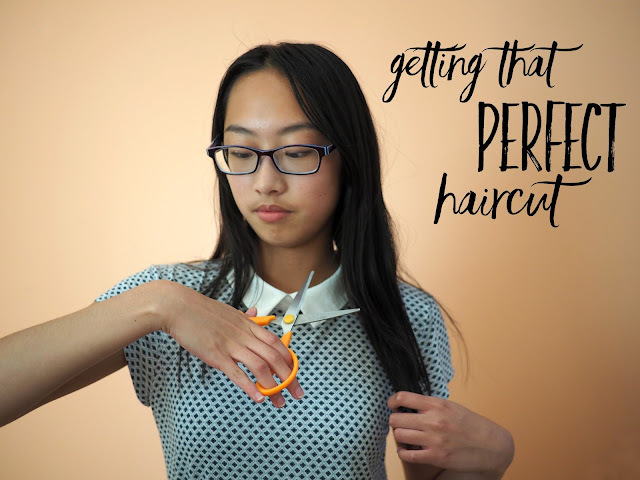 Throughout my experiences of bad haircuts, I've picked up a few things that definitely help if you're trying to get a certain look and up the probability of a great cut. Ask for it to be cut shorter than you want. I've always had issues where my hair has been cut much shorter than I ask for. The best thing to do is to ask for them to cut off about 1/2 an inch less than what you really want, because it's not going to be exact. If you realize that it's still longer than you want, no problem! Ask the stylist to trim off a little more and it's no big deal. However, if they cut more than you want, there's nothing to do except wait for it to grow back. Be specific. Don't just give a quick run through of what you want, otherwise the stylist has no idea what you want. It's not enough to just ask for a length, mention how you want the layering to be, if you want it to frame your face, where the shortest point should be and where the longest length should be. There's no such thing as being too specific. Show a picture. This sounds a little overboard, but the thing is, the picture that you're painting in your mind through your words might not get through to the stylist the same way that you're imagining it. For example, when you say, light layers, there's always the question of how "light" is light? Having a visual representation can help to convey to the stylist what you want. If you don't like it, speak up! I've made this mistake way too many times. Often, when I see what they've done with my hair, I genuinely don't like it, but I feel bad to say that I don't. If you don't like the way that it looks, mention it so that they can potentially fix it. Remember that the people there want you to leave happy! If all else fails, learn to love your new look, even if it's not what you originally pictured. Some of the best things flourish from mistakes and at the end of the day, it's just hair.